Westworld cast says new season will make the first look like "a genteel kitchen drama"
If you’re spoiler-averse, it’s not too late to turn back for a sarsaparilla. First off, Jeffrey Wright, who plays the newly-awakened host Bernard, says the “scale of season 2 is just nuts, literally right out of the gate.” Though the second season’s production schedule hasn’t been quite as protracted as the first’s, Wright describes the new episodes as “so much more expansive, [they] makes the first season look like a genteel kitchen drama.” As for his character, Wright says Bernard’s “trying to do a high-wire act on a razor blade with the humans on one side and the hosts on the other, and he’s perched dangerously in the middle.” The actor, who was nominated for an Emmy for his work in season one, also touched on the creepy new “drone hosts” that Delos will roll out. And what about Maeve, the brothel owner turned, well, it’s not entirely clear what the upgrades she gave herself last season will mean for her in the new episodes. “I was kind of freaked out at first because I had no idea where my character was going this season,” Thandie Newton says. 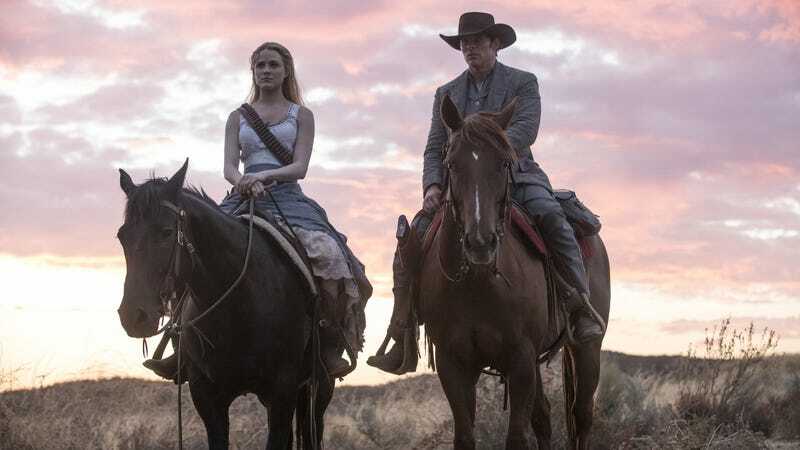 “Westworld stripped us bare of what we had and forces us and the audience to rethink what you’ve learned from that and what you know about these characters. It’s not contrived, though, it’s genuine to what they have mapped out.” Apparently, no one really anticipated where their character arcs were going—Wood says she’s still uncovering the meaning behind some of her season-one lines. The Man In Black, a.k.a. William, will be back, though he’ll have to play the park’s game according to the hosts’ new rules. The ’bots have little consideration for human life now, something that William’s all too familiar with. “It’s a pretty trippy second year, man, I gotta tell you that,” Ed Harris says. “Hopefully somebody can explain it all to me after it airs. But it’s going to be tremendously watchable.” It actually sounds like he has a pretty good handle on things, though. “What is memory, what is real, what is now, what is then, and what is the future?” Harris tells EW. “I’m not sure if you always know, if Jonah and Lisa care if you know, or if you’re supposed to know. It’s part of the mystery and challenge of it. The show is making a statement about life, memory, time, and dimensions.” We’ll journey further into William’s past, so you can expect more Jimmi Simpson in season two. Check out the EW cover story for more info, including what exactly “SW” stands for in Westworld.